Roundtable: What is 2019’s must-watch day of racing? There are hundreds of races each year, but for us, a few stand out as must-watch events. Here are five days guaranteed to deliver drama. Every year, the pro cycling calendar is rife with exciting races. Some of these are unexpected, but there are always a few days we know will deliver thrilling action. As journalists and fans of the sport, we look forward to a few pivotal days every season. Some of us prefer classics action, others love the soaring climbs of a grand tour. So, four of our editors sat down for a roundtable to pick our must-watch races of 2019. Fred Dreier, @freddreier: I’m greedy, and thus I have two days of racing that I’m most looking forward to in 2019, so mark these down on your calendar. The first date is April 28 for Liège-Bastogne-Liège. I know, I know, in this era Liège is often a dull affair that lacks the punch of those spicy editions in the late 1990s. This year, however, organizers have moved the finish from Ans to downtown Liège, offering some flat kilometers to potentially bring groups back together. I’m curious to see how riders adjust to this shift, and whether the new finish creates a rivalry between the fast-finishing climbers (Valverde), and classics men (Peter Sagan, Greg Van Avermaet). The Ardennes races have gotten a bad rap for being snoozy. So will this new finish make Liège cool again? My next date is July 20, which is stage 14 of the Tour de France. It’s another short, tough, experimental day in the Pyrenees: 117km with two monster climbs, including the summit finish on the Tourmalet. This day will not decide the Tour. However, it is bound to show us which riders are on the best climbing form. The Tourmalet is a brute, and while it’s not a steep affair, it is the perfect battleground between the sport’s measured time-trial climbers (Froome, Thomas), and the more explosive, punchy riders (Bardet, Quintana). We saw plenty of fireworks during the 2018 Tour’s short stage to Col du Portet. My guess is we will see similar action on the Tourmalet. Spencer Powlison, @spino_powerlegs: My favorite moments as a cycling fan are when I jump out of my seat in disbelief and amazement. I love surprises, and usually, the one-day classics are the best races to get my fix. Of course, I’ll eagerly await early April’s cobbles week. 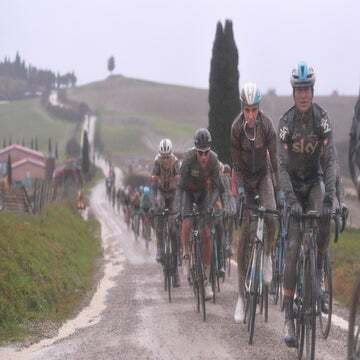 But for 2019, I’m picking Strade Bianche as my must-watch day of racing. It has the explosive unpredictability of Flanders or Roubaix. It has the epic scenery: white, dusty (or muddy) roads, rolling hills. Most importantly, though, it doesn’t really favor a specific type of cyclist. While we can pare down the slate of Roubaix favorites to a manageable list, Strade Bianche merges the top riders from cobbled classics and the hilly Ardennes. Just look back at the list of former winners: Benoot, Kwiatkowski, Cancellara, Stybar. Plus, pure climbers like Bardet and Valverde are often on the podium. I also like how Strade Bianche is an opportunity for newcomers like Wout van Aert to announce themselves in the WorldTour peloton. 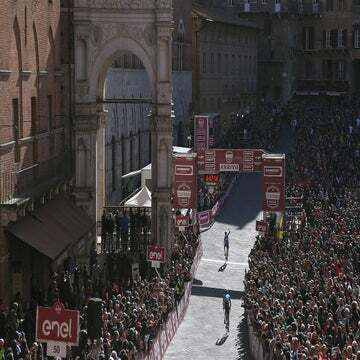 March 7, and the race’s painful final climb to Siena, Italy, can’t come soon enough. Chris Case, @chrisjustincase: If I was forced to choose just one Giro stage to watch, it would be this 226-kilometer epic. I know, it’s a little old-school — a little too long, a little too hard, and therefore, with a high potential for being heavily controlled. Still, I can’t help but imagine the possibilities. That’s because stage 16 takes in two of the most legendary climbs the Giro has ever used: Passo di Gavia and Passo del Mortirolo. (It helps that I’ve ridden each, so I’m well aware of the torture the riders face.) The Gavia has produced what many Americans think of as the quintessential Giro moment: Andy Hampsten, riding through a blizzard, clad in the blue jersey as leader of the “combination” category, with red arm warmers and black 7-Eleven shorts, and his sunken face behind yellow-lensed Oakley Factory Pilot glasses. 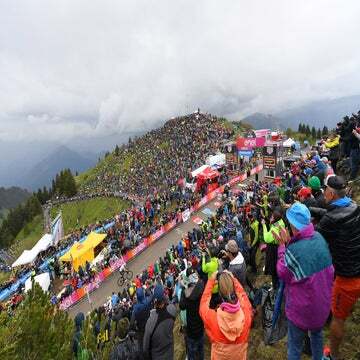 If that doesn’t epitomize the dark side of the Giro — monster climbs and nasty weather — what does? And then there’s the Mortirolo. Numbers don’t do it justice. The 12.8-kilometer, 10.1-percent average gradient climb oozes savagery. Stretches of 18 percent mean one thing: high-definition agony. I guess my old-school lust for such things is why I look forward to this old-school stage that’s all about thoroughly ridiculous races. Andrew Hood, @eurohoody: I’m old-school, and some things never change. I dig the northern classics, and most of all, Paris-Roubaix. Of any one singular day of racing, Roubaix is always tops in my book. It’s the one race of the year that never fails to deliver drama, tension, and a surprise storyline. Roubaix is a race more than any other where luck, weather, and dogged persistence play a much bigger role. A puncture, a crash — or both — can spell doom, but sometimes someone who crashes and punctures can still battle on to win. I’m not a huge fan of seeing the cobbles in the grand tours, but watching the big burly cobble-eaters bash over the pavé in the all-or-nothing one-day is about as good as it gets in cycling. For one day each spring, power meters and VAM don’t matter. And it’s glorious. Roundtable: Why is Strade Bianche such a thriller?